Product categories of Reaction Steam Turbine, we are specialized manufacturers from China, Reaction Steam Turbine, Reaction Steam Turbine suppliers/factory, wholesale high-quality products of Reaction Steam Turbine R & D and manufacturing, we have the perfect after-sales service and technical support. Look forward to your cooperation! A reaction turbine is a type of Steam Turbine that works on the principle that the rotor spins, as the name suggests, from a reaction force rather than an impact or impulse force. In a reaction turbine there are no nozzles to direct the steam like in the impulse turbine. Instead, the blades that project radially from the outer edge of the rotor are shaped and mounted so that the shape between the blades, created by the cross-section, create the shape of a nozzle. These blades are mounted on the revolving part of the rotor and are called the moving blades. In the case of reaction turbine, the moving blades of a turbine are shaped in such a way that the steam expands and drops in pressure as it passes through them. As a result of pressure decrease in the moving blade, a reaction force will be produced. This force will make the blades to rotate. A reaction turbine has rows of fixed blades alternating with rows of moving blades. The steam expands first in the stationary or fixed blades where it gains some velocity as it drops in pressure. Then enters the moving blades where its direction of flow is changed thus producing an impulse force on the moving blades. In addition, however, the steam upon passing through the moving blades, again expands and further drops in pressure giving a reaction force to the blades. This sequence is repeated as the steam passes through additional rows of fixed and moving blades. 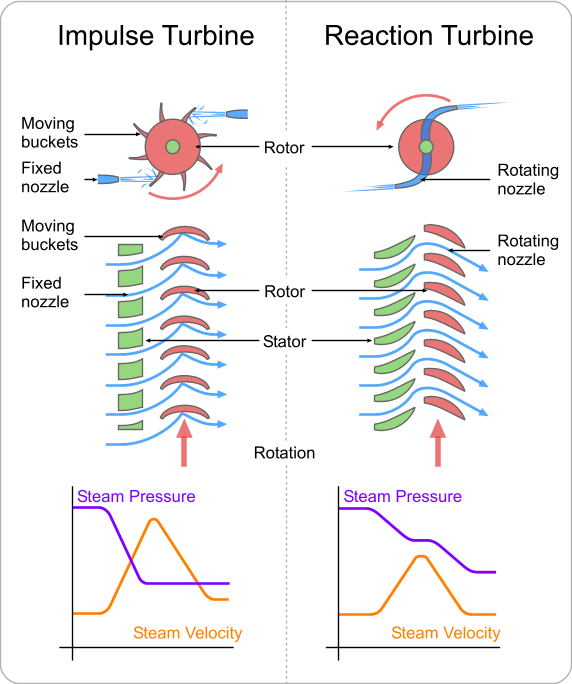 Note that the steam pressure drops across both the fixed and the moving blades while the absolute velocity rises in the fixed blades and drops in the moving blades. The distinguishing feature of the reaction turbine is the fact that the pressure does drop across the moving blades. In other words, there is a pressure difference between the inlet to the moving blades and the outlet from the moving blades. There is a difference in pressure across the moving blades. The steam will, therefore, tend to leak around the periphery of the blades instead of passing through them. Hence the blade clearances as to maintain as minimum as possible. Also, due to the pressure drop across the moving blades, an unbalanced thrust will be developed upon the rotor and some arrangement must be made to balance this.